1. April 2015. 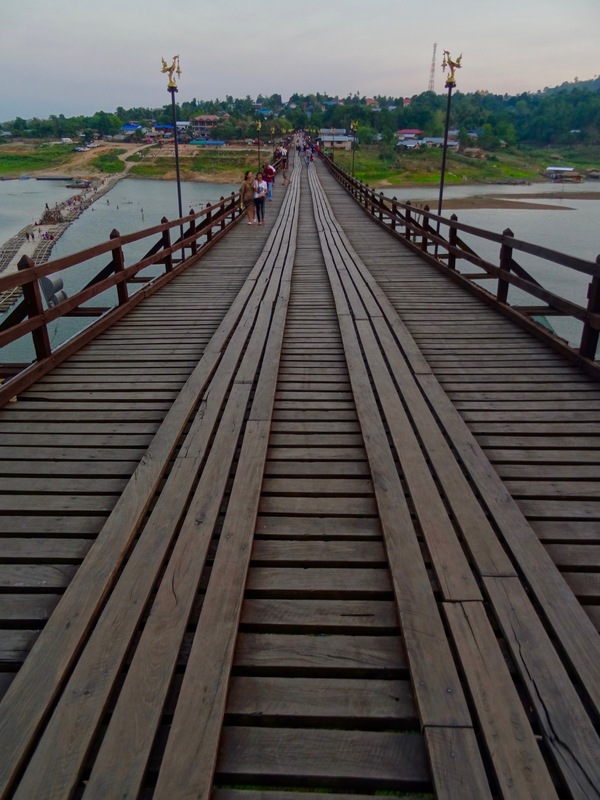 The picturesque water town of Sangkhlaburi is one of my favorite places in Thailand and I’ll never forget that special WOW moment when I first laid eyes upon its stupendous wooden bridge. 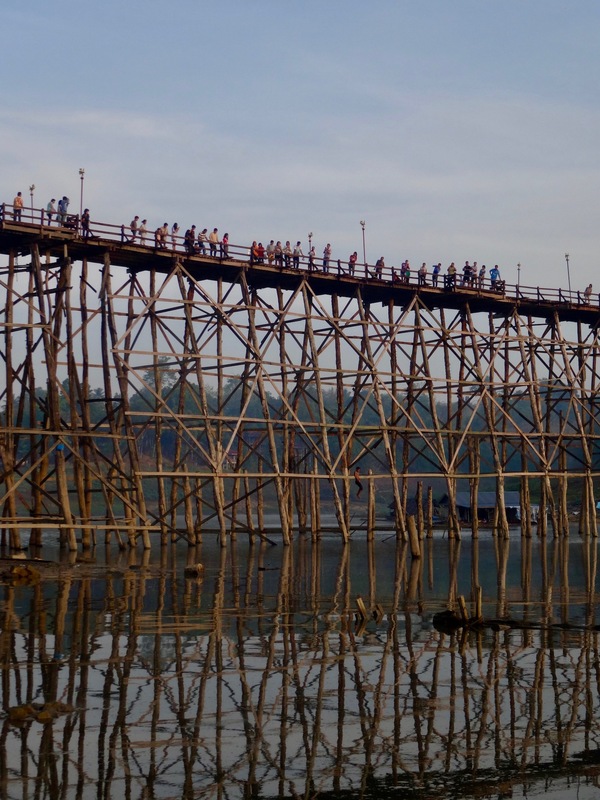 At 440 meters long, Saphan Mon is is the country’s longest wooden bridge, which connects the town’s mainly Thai community on one side with the region’s Burmese Mon minority settlement on the other. Predominantly handmade in the 1980s, the bridge had to be restored in 2013 after a part of it collapsed during torrential rain. 2. April 2015. Saphan Mon Bridge straddles the manmade Khao Laem Reservoir and overlooks a dramatic backdrop of green hills. A sunset stroll from one side to the other is one of Sangkhlaburi’s great joys and, even better, it’s usually a quiet one as the town is off the main tourist trail and rarely feels overrun. 3. April 2015. 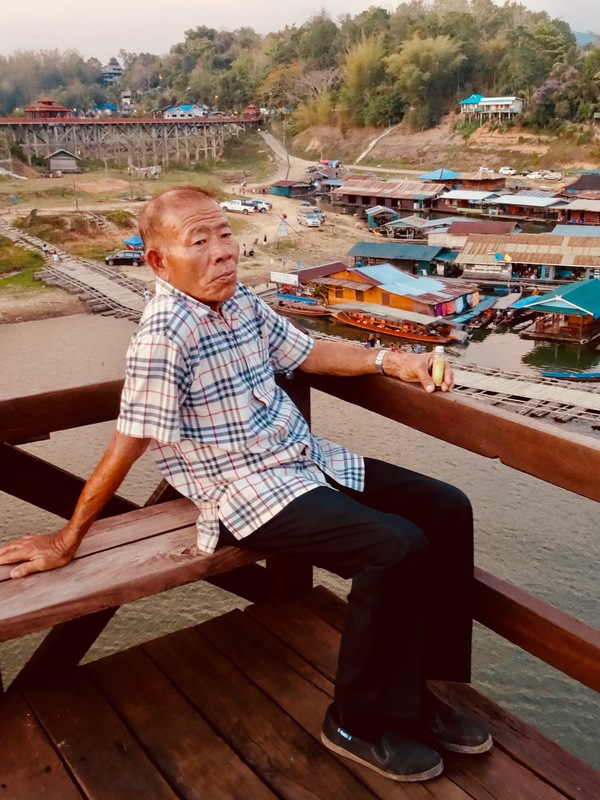 My travel buddy David and I spent over an hour wandering about on Saphan Mon Bridge gazing out over the houseboat village and watching local teenagers jump off into the reservoir. 4. April 2015. In past years there have been heightened tensions between Sangkhlaburi’s two communities and the bridge has been host to violent clashes between the Thais and the Mon. Happily a peaceful vibe prevailed on the afternoon of my visit and I was delighted to add Sangkhlaburi to my Sittin’ Doin’ Nothin’ archives. This old local was positively resplendent in his sittingness and nothingness. 5. April 2015. On our final day in Sangkhlaburi Saphan Mon Bridge was the focal point for a day of intense celebrations. 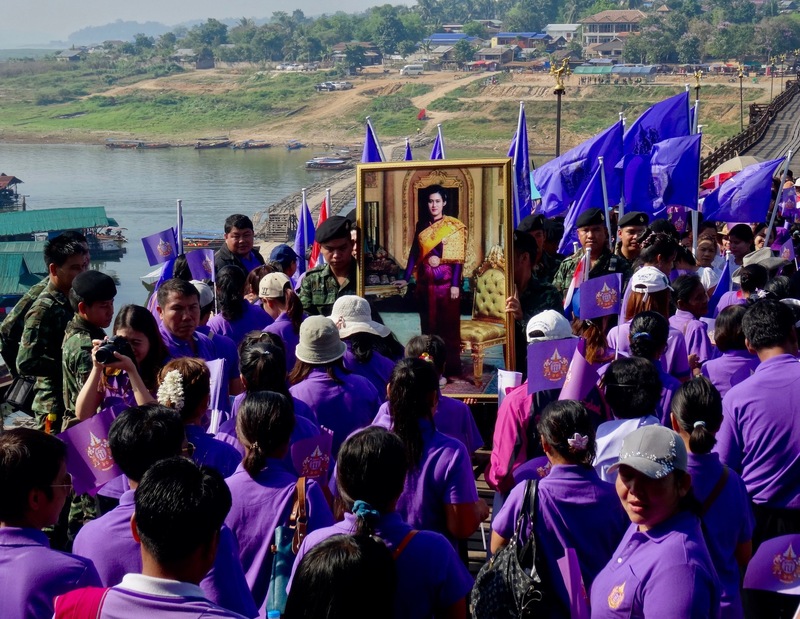 It was Princess Maha Chakri Sirindhorn’s 60th birthday and the town’s locals were out in force dressed in traditional Thai purple and waving flags. A giant painting of the princess was held aloft and a middle-aged man who looked like a dignitary of some sort gave a rousing speech. There were armed soldiers scattered about, which gave things a bit of an edge, but otherwise the mood was buoyant and as outsiders we were welcomed by everyone we met. For more on this incredible Thai town, take a look at my other 5s on Sangkhlaburi. That’s some bridge! Amazing. I understand why the village is one of your favorites.